The NFC Wild Card playoff game on January 4, 2004 featured the Green Bay Packers, winners of the NFC North with a 10-6 record, against the visiting Seattle Seahawks, also a 10-6 team that had placed second in the NFC West. The Packers, coached by Mike Sherman for the fourth year, had struggled through much of the season and were at 6-6 after a Thanksgiving loss at Detroit, but won their remaining games to win the division. 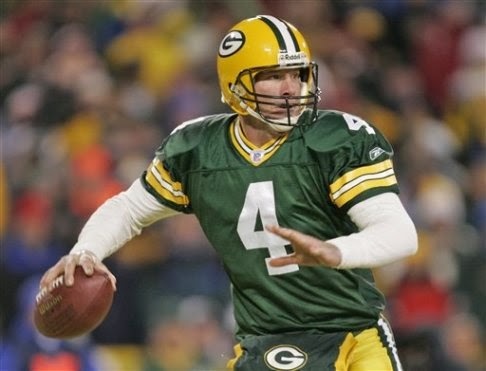 The key to the offense was 34-year-old QB Brett Favre (pictured above), as had been the case for over a decade. Seemingly indestructible, Favre had been playing with a broken thumb on his throwing hand for the previous eleven weeks. 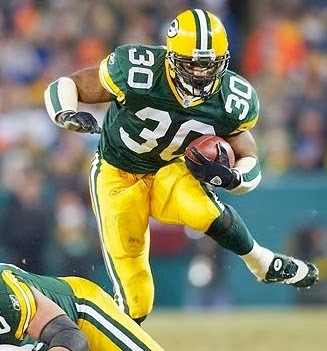 RB Ahman Green rushed for a NFC-leading 1883 yards during the season. Second-year WR Javon Walker emerged as a fine deep threat while WR Donald Driver remained the top receiver. The midseason addition of NT Grady Jackson boosted the defense and rookie MLB Nick Barnett led the club in tackles. Seattle was coached by Mike Holmgren, who had led the Packers to two NFC Championships and a Super Bowl win in 1996-97. Now he had the Seahawks in the playoffs for the first time in four years, but while they had been undefeated at home, they were only 2-6 on the road. QB Matt Hasselbeck, who had originally been drafted by Green Bay, directed the offense with skill and RB Shaun Alexander was productive. The pass defense was suspect, ranking 27th in the NFL during the regular season. It was a 20-degree day with a wind chill that was far lower and there were 71,457 fans in attendance at Lambeau Field. The Packers punted following their first possession and Seattle drove 57 yards in ten plays. 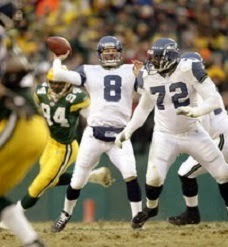 Matt Hasselbeck completed consecutive passes to WR Koren Robinson for 11 and 15 yards to get the series underway and with Shaun Alexander contributing runs of 8 and 17 yards along the way, the Seahawks reached the Green Bay nine. However, from there Alexander lost yardage on two carries and, after Hasselbeck’s third down pass fell incomplete, Josh Brown kicked a 30-yard field goal. The teams traded punts for the remainder of the opening period. Early in the second quarter, the Packers took possession at midfield following a punt and moved quickly to the Seattle 21 when Brett Favre threw to FB William Henderson for a 29-yard gain. Two carries by Ahman Green (pictured below) picked up eight yards and, after an incomplete pass on third down, Ryan Longwell tied the score with a 31-yard field goal. The Seahawks came back with an eight-play, 51-yard drive. Hasselbeck had a 28-yard completion to WR Bobby Engram to get the ball to the Green Bay 28, but after getting a first down at the 17, Hasselbeck was held to three incomplete passes and Seattle settled for a 35-yard field goal by Brown that put the visitors back in front. Green Bay came back quickly, taking five plays to advance 80 yards. Favre immediately connected with Javon Walker for a 44-yard gain to the Seattle 36. Another pass, this time to Green, picked up another 13 yards and Favre finished the series with a throw to TE Bubba Franks for a 23-yard touchdown. Longwell kicked the extra point and the Packers had a 10-6 lead. The Seahawks lost yardage and had to punt following their next series and the Packers got the ball back in Seattle territory with 2:18 remaining in the half. In a possession featuring a Favre pass to Donald Driver that gained 23 yards, the Packers managed to add to their lead when Longwell booted a 27-yard field goal. The score was 13-6 at halftime. The Seahawks had the first possession in the third quarter and drove 74 yards in ten plays. Hasselbeck completed five passes along the way, starting with a throw to WR Darrell Jackson that picked up 25 yards to start things off. TE Itula Mili had two receptions that totaled 29 yards and, on fourth-and-goal at the Green Bay one, Alexander scored a touchdown. Adding Brown’s extra point, the game was tied at 13-13. Following a punt by the Packers, Seattle again mounted a scoring drive, this time advancing 77 yards in 11 plays. Six of the plays were Hasselbeck pass completions, including one to Engram for 15 yards on third-and-four and another to Robinson that picked up 33 yards to the Green Bay 19. Once again, Alexander ran for a one-yard TD and, adding on Brown’s PAT, the visitors were up by 20-13. Green Bay came back with a 12-play, 60-yard series that extended into the fourth quarter. Favre completed all five of his passes and Green ran for two yards on a fourth-and-one play at the Seattle three. Green followed up by gaining the last yard for a touchdown and, with Longwell adding the extra point, the game was once again tied at 20-20 with ten minutes remaining in regulation. The Seahawks went three-and-out on their next possession and Tom Rouen’s punt was returned 21 yards by WR Antonio Chatman for good field position at the Seattle 49. Favre completed three passes and Green again converted a fourth down with a two-yard carry (although he lost the ball at the end, it was ruled that his forward progress had been stopped before the fumble, much to the consternation of Mike Holmgren), one of his six during the 12-play, 51-yard drive. He picked up a total of 21 yards, including one yard for a TD. Longwell’s extra point again made it a seven-point contest with the clock now down to less than three minutes. The Seahawks took over at their 33 following the kickoff and Hasselbeck immediately passed to Robinson for nine yards and Jackson for another 16. Now at the Green Bay 42, on the second play after the two-minute warning Hasselbeck connected with Engram for 34 yards to the eight. Alexander ran for two yards, a five-yard penalty moved the ball to the one, and it was Alexander going the final yard for a TD. Brown’s extra point again knotted the score at 27-27. The Packers still had 51 seconds to work with and reached the Seattle 30 after Favre threw to Walker for 27 yards. But after letting the clock run down, Longwell’s 47-yard field goal attempt was unsuccessful and the game headed into overtime. Seattle won the toss, with Hasselbeck shouting “We want the ball, we’re going to score”. The Seahawks didn’t, however, and the teams traded punts in OT. 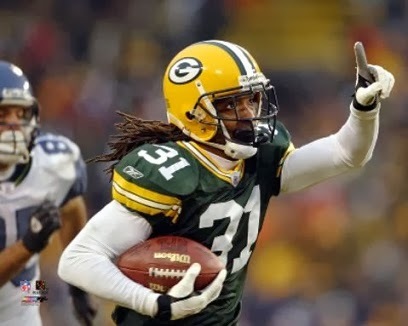 On Seattle’s second series, and facing third-and-11 at its own 45, Hasselbeck threw a pass that was intercepted by CB Al Harris (pictured below), who cut in front of WR Alex Bannister at the last moment. With clear sailing in front of him, Harris returned it 52 yards down the sideline for a touchdown and Green Bay came away with a stunning 33-27 win. It was the first time a defensive play ended a NFL overtime playoff game. The Packers had the edge in total yards (397 to 340) while the teams were even with 22 first downs apiece. Neither club ran the ball consistently, with Green Bay compiling 78 yards on 32 carries and the Seahawks gaining 49 yards on 21 attempts. There was only one turnover in the game, and it was the game-winning play. Brett Favre completed 26 of 38 passes for 319 yards and a touchdown with no interceptions. Donald Driver caught 6 passes for 66 yards while Javon Walker gained 111 yards on his 5 receptions. Ahman Green ran for 66 yards on 23 carries, including two TDs and the two big fourth down conversions, and contributed 5 catches for 44 more yards. For the Seahawks, Matt Hasselbeck (pictured at right) was successful on 25 of 45 throws for 305 yards and no TDs with the one big interception. Shaun Alexander gained just 45 yards on 20 rushing attempts, but had the three short scoring carries. Koren Robinson led the club with 7 catches for 88 yards and Itula Mili had 6 receptions for 62 yards while Bobby Engram gained 83 yards on his four catches. The Packers went on to lose a close contest in overtime at Philadelphia in the Divisional round. They repeated as North Division champs in 2004 but lost in the Wild Card playoff game. Seattle had a lesser record at 9-7 but won the NFC West, also falling in the first round.